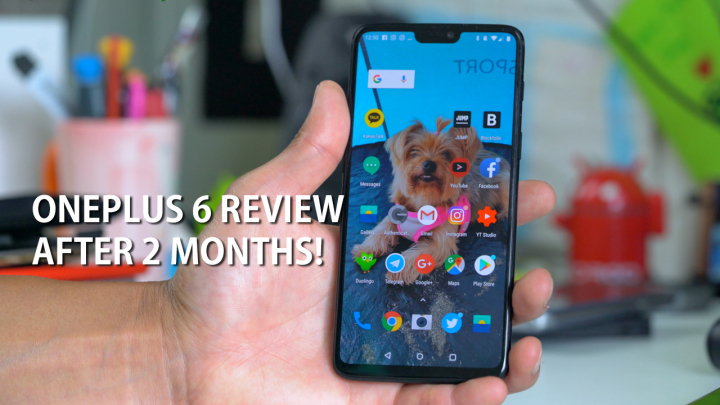 OnePlus 6 Review After 2 Months! – Finally a Flagship Killer! I’ve used almost every OnePlus smartphone ever since the original OnePlus One came out a few years back and have to conclude that the OnePlus 6 is the most impressive so far. In fact, these days I use the OnePlus 6 more than any of my other smartphones. In this review, we are going to cover what’s good and bad with the OnePlus 6 and also why it can finally be a “flagship killer”. First, OnePlus 6 is the thinnest smartphone out this year in comparison to major flagships like the Samsung Galaxy S9 or LG G7. It is thinner than both of them while its screen is bigger at a whopping 6.28 inches. For anyone who wants the thinnest smartphone with the largest screen, OnePlus 6 may be the way to go. I realized this became crucial as over this summer I started playing more golf with my daughter, who is playing a few junior golf tournaments. Specifically, having a thick or heavy smartphone in your pocket while playing golf really weighs your pants down and I found OnePlus 6 is my best choice when playing golf. Normally, I do stick my smartphone in the golf bag but since the OnePlus 6 has excellent 240fps slow-motion camera, I tend to carry it in my pocket so I can make slow-motion videos of my daughter’s golf swing to help her analyze her missed shots. And yes, 240fps slow-motion camera is actually the best I have seen this year with the OnePlus 6 as it is the sweet spot for having slow enough slow-motion without losing too much quality. Super slow motion modes found in phones like the Samsung Galaxy S9 is great for catching a split-second slow-motion video of something but I found it very useless for golf swings as it does not record the whole swing and also it is hard to capture the right moment. With 240fps, you get full 60 seconds of slow-motion footage and also easily edit and upload to social networks like Instagram, Facebook, and Twitter. Now, Galaxy S9 also does have 240fps slow motion but I did a full comparison between the OnePlus 6 vs. Galaxy S9 and found the OnePlus 6 slightly better suited for the job. I also recorded some awesome footage of fireworks during July 4th Independence Day, which looks simply amazing. OnePlus 6 also have one of the fastest performance if not the fastest this year out of all the flagships. It is built on pure Google Android OS dubbed “Oxygen OS”. Instead of clogging up the UI with laggy software, OnePlus has actually done the opposite, optimized for performance along with 8 gigs of RAM(for 128/256GB model), that makes it perform faster than any other smartphone on the market today. Not only that, OnePlus is built for rooting and custom ROMs. If you are a gamer and need to use game controllers to the fullest or want to use game tools like game hacks/cheats, you will also want to root your phone as it makes everything easier. OnePlus 6 can be easily rooted and you do NOT VOID WARRANTY as OnePlus company fully supports rooting. It is the ultimate rooter’s smartphone. Combine that with its fast performance and dedicated gaming mode(that won’t disturb you while you play games), makes OnePlus 6 one of the best smartphones for gamers also. Both front and back camera have image quality as good as any of the flagships and you won’t have problems taking high-quality photos, just check out my camera comparison video between the OnePlus 6 vs. Pixel 2 vs. Galaxy S9 here. Couple it with Google HDR+ camera in the future and it may even perform better than the Pixel 2, which I consider the king of smartphone photography. Of course, don’t forget 4K 60fps and 240/480fps slow motion modes, both of which are missing on the new LG G7 ThinQ. Considering OnePlus really isn’t a big company like LG, it is amazing that they have added features LG missed out on. What’s missing with OnePlus 6? It does NOT have a microSD card slot. While it does have fast UFS 2.1 internal storage, having no microSD card slot means you are not going to be able to expand the storage nor save your photos/videos in case you break your phone. Also, there is no 1440P resolution, you are stuck with 1080P resolution. And also there is no IP68 rating(although it does have very good water-proofing design) and wireless charging. Its DASH charge is also NOT COMPATIBLE with Quick Charge 3.0, you will be stuck with slow charging if you don’t buy extra accessories for it. However, DASH charge is slightly faster than Quick Charge 3.0 and will charge faster especially when you absolutely need quick charging within 10 minutes. You can pick up some extra DASH chargers along with a car charger and USB Power bank to solve those issues. If you break the screen on the OnePlus 6, it may be hard to get the screen replaced at a local store in the U.S. since they don’t have brick-and-mortar stores everywhere. You may want to buy a good case that will protect the screen. If above issues don’t bother you or maybe not an issue, OnePlus 6 may be the right choice. I still use the OnePlus 6 as my daily driver as its good features definitely outweighs the bad ones. And yes, I love my OnePlus 6. Of course, price is right with the OnePlus 6. The basic model with 64GB of storage and 6GB of RAM starts at $529 while the higher 128GB of storage and 8GB of RAM is priced at $579. While not super cheap, you will still be able to pick one up for about $100 cheaper than Samsung Galaxy S9 or LG G7 ThinQ(both which go for around $650 on eBay atm). Wanna buy OnePlus 6? Go to OnePlus website here. Next story How to Clean Smartphone w/o Scratching the Screen!